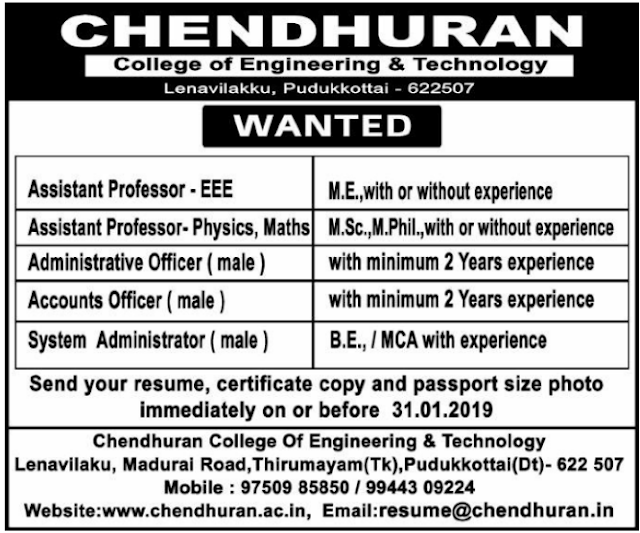 Chendhuran College of Engineering and Technology Pudukkottai has advertised in the DINAMALAR newspaper for the recruitment of Assistant Professor Plus Non-Faculty jobs vacancies. Interested and eligible job aspirants are requested to apply on or before 31st January 2019. Check out further more details below. About College: Chendhuran College of Engineering and Technology was established by Thiruchendur Murugan Trust on 6th July 2006, with the noble vision to heave professionals and leaders of high intellectual caliber and immaculate character, nurtured with a well-built motivation and obligation to serve humanity. The College was started as a private self-financing engineering college imparting knowledge in the areas of engineering, technology and education.